Sterile Set designed for dressing the operator; ideal for all dental implant surgery, periodontal surgery and maxillofacial operations. The set is packed in a sterile double wrapping, wrapped in medical grade paper. The convenient detachable label allows easy traceability of the operation. 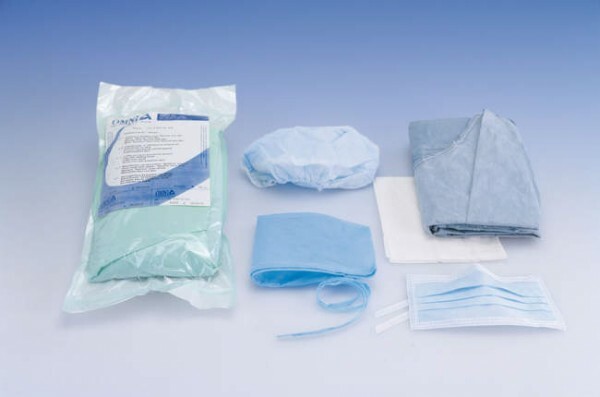 Each set consists of: 1 Expo model gown (size L) in Softesse with surgical fold and 2 hand towels wrapped in medical grade paper - light blue; 1 Cap with adjustable ties, in light blue NWF; 1 SPIRITUS PLUS® mask with ties, in light blue NWF; 2 Non-slip shoe covers, in light blue NWF.